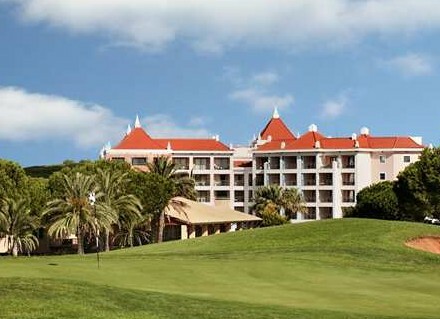 Discover the multi-award winning Hilton Vilamoura As Cascatas Golf Resort & Spa, voted Portugal’s leading golf resort and ranked as one of the world’s best hotels by Expedia. Relax in one of 176 modern guest rooms with private balconies, or upgrade to an apartment with a separate living area and enjoy home cooking in a fully equipped kitchen. This Algarve hotel is situated on five acres of landscaped gardens. Play on one of two golf courses. Plunge into one of six large pools and sip on cocktails from the poolside bar while relaxing on a lounger. Unwind with a massage at Vilamoura's largest spa, 7Seven Spa (service surcharge), while the children play at the summertime Paradise Island Kids Club. Visit nearby Falesia Beach and try water sports before nibbling on bar snacks at the seasonal As Cascatas Hilton Beach Club. Golf Course Details The first nine holes meander over the fairway under a canopy of Umbrella Pines and carefully placed bunkers dot the course with a handful of water hazards providing the challenge seasoned golfers will appreciate. The back nine returns gently uphill, opening up to rewarding views over azure waters and the Atlantic.